The Heinkel He 49 was a fabric covered metal construction Biplane powered by a liquid cooled BMW VI engine producing 750 horsepower, giving it a top speed of 199 mph. The first prototype flew in November 1932, the He 49a. This was followed by two more prototypes the He 49b and He 49c. With the He49c having fairings on its landing gear. The next model being the He 51 which first flew in May 1933. This aircraft was part of the plan to rebuild Germany’s military after the Great War. Officially the aircraft was said to be a trainer, but it was in fact a fighter designed for the still secret Luftwaffe. The first production aircraft were delivered to the Luftwaffe in 1934 and became its first fighter. It was armed with two MG 17 7.92 machine guns. The Heinkel He 51 took part in the Spanish civil war, the first being sent to Spain in August 1936. It was flown by Spanish Nationalists and German pilots who volunteered to fly for General Franco’s air force. While not a success as a fighter, it proved better as a ground attack aircraft in the Spanish war. The He 51C-1 model could carry six 10 kg bombs. However it did give the Luftwaffe pilots combat experience for the forth coming war. One of the German pilots who flew the Heinkel He 51 in the Spanish civil war was Adolf Galland, who went on to become one of Germany’s ace fighter pilots of World War Two. However he was unable to gain any victories in Spain. 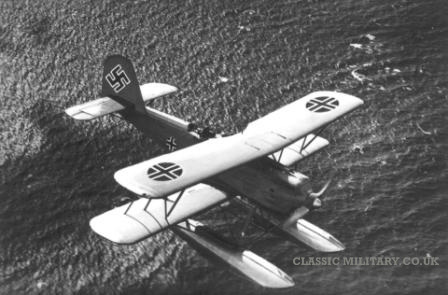 There was a seaplane version of the Heinkel, the He 51B-2. Two floats replaced the landing gear, it was also fitted with catapult equipment so it could be lunched from ships. 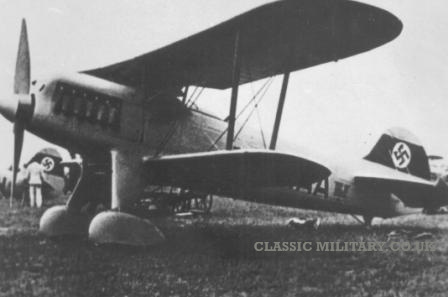 At the end of 1936 the Soviets started to supply the Republicans with the Polikarpov I-15 fighter plane which soon outclassed the Heinkel. It saw out the rest of the war in a ground attack roll. It was replaced from April 1937 by the far superior Messerschmitt Bf 109. With only about seven hundred He 49/51’s being produced.